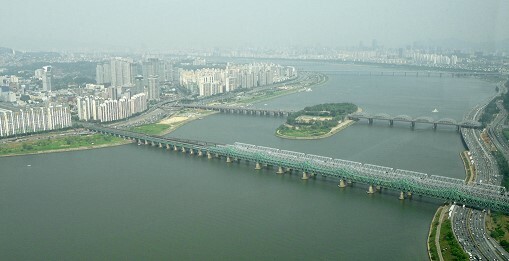 In Seoul, Korea, there is a railway bridge over the Han River, and a road bridge, which crosses a small island. Half of each of these bridges has one pylon-truss structure, and the other half has a completely different structure. Tens of thousands of people cross these bridges every day by car, by taxi or on the metro. There is no bump, no swerve: the surfaces that you travel over are smooth. Just over Fifty-five years ago, the original bridges were blown up by the South Korean army, in an effort to stop the North Korean army advance. Thousands of civilian refugees were on the bridge, and hundreds were killed. The North Korean engineers re-built the spans in less than a week. The detonation was of little value, and came at great cost. The breaks in these bridges might act as a metaphor for trauma. A person makes the best decision they can in a difficult situation, and then lives with the result –as do those around them. Afterwards, people adapt and get on with their lives, as do their children adapt to parents who have just got on with their lives under the ‘50year cease fire’. They build ‘bridges’ from trauma and inconsolable loss to ordinary life; or re-build over it, and re-surface it until there is not even a bump. But if you look for just a moment at the structures under what they do, the trauma is written there, as are their actions in that past critical moment, as are other assumptions about what is traumatic and what is normal, what are the relatively sound adaptations (as opposed to fragile or flawed ones) to the dangerous and hostile aspects of the world, and what are the reasonable collateral losses (as opposed to unacceptable or intolerable losses). The bridges also served as another reminder; that almost every human being living in the city over the age of 60 had first-person experience of the Korean War. And that everyone over the age of 30 was most likely a child of two war survivors, carrying their stories and adaptations. The early research on intergenerational transmission of trauma has focused heavily on Jewish Holocaust survivors and their children, and more recently work seems to be looking at specific populations including Aboriginal and First Nation peoples, and persecuted ethnic minorities, or alternatively at using the framework of multi-generational trauma to understand on-going interpersonal trauma. Multigenerational trauma and adaptation to it is in all of us, even if we belong to a majority population. Most of us have seen war or war-like traumas. The large-scale destruction and re-construction of ways of living in the 20th century have touched every human on the planet, and they are not yet finished. Just about every one of us has been in the generation who survived, or the first or second generation after, massive traumatic upheavals. For example, in Britain from 1939 to 1944, 3.5 million children were separated from their families and relocated to ‘safety’ under “Operation Pied Piper”. Imagine being 6 years old, being put on a train by your own parents to live with complete strangers in a totally different place, isolated in the countryside perhaps, separated from everyone you ever knew (or if you were lucky you might have kept hold of a sibling’s hand), and not knowing when you would come back, while everyone you ask replies ‘until the war is over’. Various forms of war trauma today would have directly or first-generation-after affected more than half of the British people alive. Operation Pied Piper had an effect on kids’ attachments not too far different from those bridge-demolishing bombs in Seoul. Such attachment ruptures due to war trauma, can be rebuilt, but just like the bridges in Seoul, there may well be a sudden change in the grid structure and the span requires careful and ongoing re-surfacing. In China, the Communist Party embarked on a monumental re-structuring of all levels of society, in particular re-writing family roles and ancient models of advantage and hierarchy, and enforcing the changes through mobs of Revolutionary Guards, and the mechanisms of public ridicule, ‘Struggle’ and ‘Re-Education’, and death by starvation. It was slower, but much longer-lived than Operation Pied Piper. Just about every adult out of the 1.3 billion modern Chinese are first, second or third generation survivors of this – and some of their new interpersonal structures may be flimsy, quickly-established to survive the Cultural Revolution and its aftermath – while others might be the same built on the same pylons as their forebears used under the centuries of Imperial reign, but with a new road surface. Trauma is not a thing that happens to some people and not to others; trauma is not a disease or a diagnosis. It is not necessarily a source of paralysis or craziness either. Traumas and our ancestors’ response to them, are built into who we are, and how we live through every day. Trauma is what gave our ancestors (including very recent ancestors) both the need to change their ways of living, and the means of adapting to their changing environment. With the future challenges of climate change, globalisation, food security, urbanization, and technology we haven’t even dreamed of yet, a multigenerational history of trauma may actually be a bonus. Octopuses are very smart. According to a lovely documentary called Aliens of the Deep Sea (2005, Idéacom International and MC4). 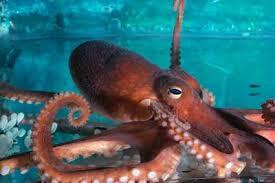 Octopuses are curious, deliberate, spatially aware, abstract thinkers, and super fast learners. They have more dexterity with their tentacles than we do with our hands. Experiments show that they can solve very complex puzzles, they have inter-octopus communication through skin colours, and they can learn very detailed things from mimicking and copying each other. There is a Spanish research group dedicated to the evaluation of the intelligence of the common octopus (octopus vulgaris), and the results they have presented are quite impressive. But the researchers propose that despite the phenomenal cosmic learning capacity and long life expectancy of the (male) octopus, they haven't made a species leap for one simple reason. They can't systematically pass knowledge to the next generation, because after protecting her first clutch of eggs, the mother always dies. So for all their extraordinary talents, the Mediterranean octopus must learn all about the world for himself, in each generation, by trial and error and imitation of other octopuses. There is no direct help from other octopuses because a male octopus - even a directly related one - doesn't appear to have the capacity for empathy, ie a spontaneous negative neurochemical sensation when another feels pain, and a positive one when another feels pleasure. They also don't bond: they are drifting individuals who are skilled at mimicry. Their brains simply don't seem to have the pathways for "I see you are frustrated trying to open that jar. Let me teach you how." And female octopuses are expendable. Even human experimenters don't bother teaching female octopuses anything. When they lay a clutch of eggs, they stop eating to protect it, and they always die just before the hatching. If they live long enough to have a clutch, they have been biologically successful. A fabulous book called Braintrust, by Patricia Churchland (Princeton University Press, 2011), proposes a link between neurological structure, oxytocin, and community, morality and cooperation. * Recognition of others' psychological states, and predicting how they will act. (Particularly handy for wolves hunting in packs, for example. * Learning social practices, through explicit and implict teaching, plus imitation. Churchland goes through each of these in detail: from the speculated evolutionary origin, to the physical structure and pathways, and chemical and hormonal mediators - of which oxytocin is key. The structure of our brain contains the maternal caring habits of mammals, carefully selected in context over millenia, and ultimately developing into multi-generational transmission of knowledge of our species. Churchland provides quite a comprehensive set of evidence to make the link from a human brain’s structure and chemistry, operating within its environment, to the social practices of being in a family, cooperating and being altruistic, having moral and ethical standards (as an individual and as a society) and enforcing those standards by punishing transgressors where it causes pain to their brains.. The author is very well read: the core material is neuroscience and moral philosophy, but the experiments and studies she uses for evidence come from diverse fields: zoology and psychology using a multitude of mammal species, human economics in Game Theory and Judgement and Decision Making, clinical psychiatry, and anthrolpology and archaeology. As a book it is very readable, well-structured, it is clear on the limits of the evidence and does not overstate its case - which is powerful enough already. Family therapists are among the very few professions interested in the inter-generational effects of an individual or an event on a family system. It is very nice to see medicine and philosophy catching up. A large proportion of medical and caring professionals - and much of the general public - still struggle to conceptualise that a person is not a solitary, drifting individual like that male octopus. Each of us is a piece in a complex communal system, we reach backwards and forwards in time to pick up and to pass on learning and resources, to support and protect kin and others. Churchland’s “Braintrust” argues that the moral (“right” and “wrong”) and ethical (community optimisation within constraints) structures to do this are actually built into our brains, and then rapidly adapt to the context of the society we are born into. If we did not have such brains, there would be no human society. This is an engrossing and thought-provoking book which suddenly puts the profession of family therapy at the forefront of philosophy and neuroscience.